Dan Garner presents performances by the Jerry Beach Blues Band, Buddy Flett & Friends, Ron Johnson, Johnny Bicknell, JR. III w/ Stanton Dossett on Sun, Oct 31, 6 to 11 pm. The event is A Tribute to Johnny Slim Campbell. The site is 516 Texas, performance center and home of the North by Northwest Louisiana Music Foundation - NXNWLA. Campbell was a charismatic performer who rambled from his home in East Texas to Shreveport in search of an audience and in a quest for more contact with the blues. In the 1980's he was a hit in Shreve Square bars and clubs. It was apparent that he loved Shreveport. In turn, he was treasured by local music fans. Having recorded 3 albums of singing and crackling guitar, he found a place for himself himself in NYC in the 1990's. Shreveporters traded tales of Johnny's success in Manhattan. "Long lines to see Johnny in a tiny bar!" "Look, Johnny's opening at a big NYC music fest." In NYC Campbell married and fathered a daughter. But on June 13, 1993, he did not arise from his bed. His unexpected death at age 41 was attributed to heat failure. It was connected by many to the injuries carried by Campbell after a car wreck in his teen years. Campbell's expertise at guitar and his ability to bring emotion to the stage became legend. Tonight at 516 Texas musician-historian Garner has assembled a group of performers who played alongside Campbell in his Shreveport sojourn. 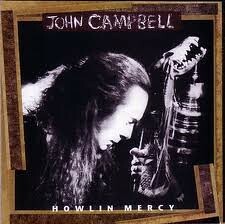 They will tell stories describing Campbell's intensity and play songs that often poured out from his heart. 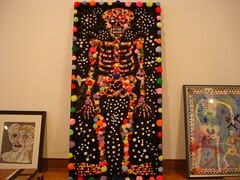 What an artful and touching alternative to the celebration of the dead. Tickets $15 online, $20 at the door. 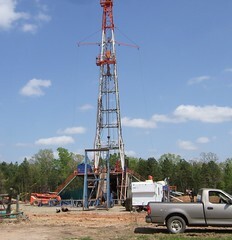 Gasland is a Michael Moore-sort of documentary on the toxicity associated with hydraulic fracture wells - the sort of wells being drilled all around this region. Filmmaker Josh Fox uses a folksy approach to his exploration of the disasters that can envelope people living close to "frack" wells. It is apparent that he has a cautionary tale with relevance for North Louisiana and for the entire nation. Natural gas producers are evidently exempt from the protections given the US environment in the Clean Water Act. That's good for the profitability of the natural gas producers. And good for the arts, since those companies seem to be careful to write checks supporting arts organizations. In the longer run, however, America runs a venereal risk in romancing the producing companies. Assuming that all the gas companies are run by good guys who will carefully protect water supplies is cretinous, says Fox. He explains the why and how of the numerous poisons used in the drilling process. He shows viewers states in which drilling was helter skelter. Crass men running companies not guided by regulatory legislation or threatened by effective fines can make a scabrous mess. Fracking with little oversight, says Fox, will bring us large checks - and perhaps earn us the curses of our children and grandchildren. See more specific warnings at Gaslandthemovie.com and at LEAN, the Louisiana Environmental Action Network. The Texas Avenue Community Association is pleased to present the 1st Annual Makers Fair, says April Dahm. 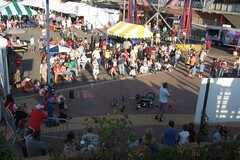 The Makers Fair will feature a wide variety of non-tradtional and traditional crafts as well as food and entertainment. Over 75 riders pedaled a route that stretched for 15 miles across East Shreveport in the second annual Velo Dendro, a tour of significant trees. Hallie Dozier, prof of forestry at LSUBR and former Shreveporter, led the tour. She was aided in the event planning by Matthew Linn and founder of Baton Rouge Advocates for Safe Streets (BRASS) founder Mark Martin. The route went from Columbia Cafe to Betty Virginia Park, where Shreveport Green's Donna Curtis and Chapellie Henderson presided over a tree planting. At the public gardens in front of First Baptist School the group looked at the crepe myrtles planted along Bayou Pierre. The route went across Broadmoor with stops at the Akers house to see the magnolia above and at AC Steere Park for a look at a champion sycamore. The group pedaled past the river along Fant Parkway while taking care to avoid nests of tiny, tire-puncturing thorns in grassy areas. Downtown, the path led to the great oaks surrounding the Courthouse. In the grove beside Columbia Cafe riders enjoyed jambalaya and a discussion of plans for the next Velo Dendro, to be planned and coordinated by A Better Shreveport with tour founders Linn and Dozier. 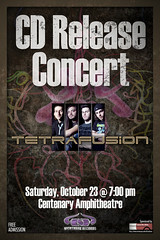 Tetrafusion is a Louisiana-based progressive metal band signed to Nightmare Records, says Gary Tubbs, who adds, " our CD Release show is Saturday, October 23rd, in The Shell at 7pm." After being established in 2006, the band released their self-produced debut,“Absolute Zero,” in February of 2009, sans vocals, to critical acclaim from the underground music scene and received rave reviews from press and new fans worldwide. The album was featured globally on over twenty commercial stations, fifty online stations, dozens of review columns, and also received positive acknowledgment in Germany’s Rock Hard, Decibel, and Progression Magazines. The album was also hailed as one of the “top albums of year” by Ultimate-Guitar.com. A year and a half later after independently selling over one-thousand albums in a total of 21 countries, the band signed to Minnesota-based metal label Nightmare Records for the worldwide release of their sophomore effort “Altered State” on October 12th, 2010. This release is the band’s first time to incorporate vocals into their work, as they will continue to do with all future material. The album is being distributed in North America and Canada by Sony/RED Music. 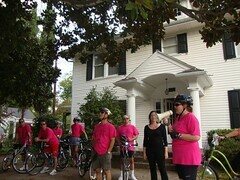 Riders are under no pressure to finish the Velo Dendro Shreveport, a family-oriented bicycle tour, says Hallie Dozier. Ride as long as you like and retire when you need to, she says. Dozier, leader and organizer, is a prof of forestry at LSUBR but knows Shreveport well; she grew up here. Her partner in producing the tour is Matthew Linn. The 15-mile route will take the riders - last year 100 bikers started the trek - from Columbia Cafe to Betty Virginia Park and thence downtown. Riders will follow the Fant Parkway past Shreve City Shopping Center to E. Preston. The route loops through Broadmoor on its way back to the start point, Columbia Cafe. Registration is $10. Riders are given a high-viz shirt and are supplied with water and snacks at key points. Shreveport's significant trees are the focus of the ride. "Velo" refers to cycling and "dendro" refers to trees. Building community is another focus. There will be numerous stops and opportunities to chat. See the ride map here. Isaac Haas, in profile, threw his large eyes upon Erin Davis, petite but also large of eyes. Their melodies alternated - both have strong, sweet voices - and then blended into a melodious cat's howl. It was the Shreveport Little Theater Academy's production of Rent on Saturday night, where expressions exploded and the singing was super. Director Jared Watson has taken a group of talented and handsome teens, found their strengths and cast them like butter into a sautee pan. Zhailon Levingston threw himself around the stage and molded his rich voice to numerous melodies. Gentry Williams beamed and crooned with capable abandon. Anchoring the stage with a voice so righteous that it rolls effortlessly from blues to opera was Emily Mwakitawa. Following in her vocal footsteps were Emma Foreman and Wallace Rakoczy, both passionate young wailers. Kaelon Gerard, a tall lad with thick vocal timbre, was, like all the principals, able to trippingly dance across the stage while hitting his notes. Yet a major component was missing from this version of Rent: no band. The excellent ensemble that SLTA has used under music director Adam Philley was caught in a schedule conflict, explained director Watson. What a shame, not to pick up a substitute group of musicians! 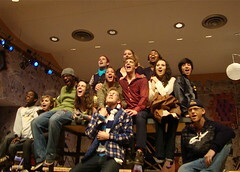 Rent is a not an easy show for a teen cast. It's a story of poverty, prostitution, hard drugs, death - and life before texting. Rent also has a complex storyline. Reading the outline before seeing the show would not be a waste of time. Teens want a show that reflects their striving for independence. Watson explained that, "This is the show these kids really wanted to do." And if there's a full measure of raunch, there's also a positive side to Rent: it glorifies friendship, loyalty, community and endurance. In the end, this production of Rent is notable for vocal power and kinetic verve. Even without live music it offers a worthy evening of entertainment. 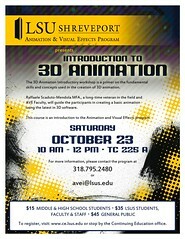 The first workshop from the Animation & Visual Effects program at LSUS for this school year will be an Introduction to 3D Animation, taught by Raffaele Scaduto-Mendola, one of the program’s faculty members. 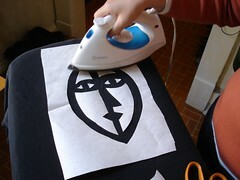 Date of the workshop, says Rachel Volden, will be October 23 at 10:00 am until 12:00pm. Guess who's coming for Halloween night? 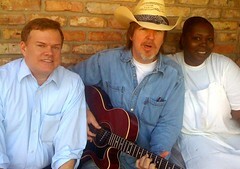 Fayetteville, Arkansas singer/singwriters Emily Kaitz & Effron White, says Jim Huckabay. Kaitz is an ex-Austinite/zany thinker who's penned quirky tunes like "Pico de Gallo" (performed by Trout Fishing, etc. ), "Shallow End of the Gene Pool", "Terminally Trendy" and "The Best Looking Man on Earth". Effron is an Arkansan with a vocal style that brings to mind Bob Dylan, Tom Waits & John Prine. He adds color with his simple, but personal, guitar style and a smattering of harmonica. In 2008 he was entered into the NW Arkansas Music Awards Hall of Fame. Put these two together on Halloween night and who knows what can happen? 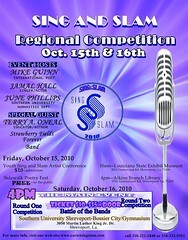 "Violet's Blue is competing in the Sing and Slam Regional Finals this Saturday, October 16th at 4 p.m," writes Erica Magnano. It's at Southern University Shreveport located at 3050 Martin Luther King Dr. Admission is $10 ahead of time or $15 at the door. You can call (318) 221-1848 or (318) 332-5353 for more information. "Come hear us perform Parish Line Road," adds Magnano, "and hopefully win a trophy and cast prize!" The Wednesday Downtown Lunch Trolley is rolling like a stone, says the Downtown Development Authority. 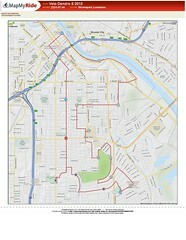 Three new restaurants will be added to the current route on Wednesday, October 13th. Downtown workers and visitors may catch a free trolley ride to one of six downtown restaurants each Wednesday from 11:00 am to 2:00 pm, says Julia Foley. It stops every 20 minutes at Regions Bank Tower, 333 Texas Street; Government Plaza, 505 Travis Street; and each of the six participating restaurants. Each restaurant has Wednesday specials that can be served and enjoyed within 20 minutes. Riders are encouraged to preview their menu choices online. Those running tight can call ahead or email the order and catch the Lunch Trolley to pick up the order to go. 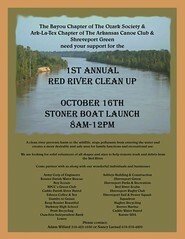 The Bayou Chapter of the Ozark Society, the Arkansas Canoe Club and Shreveport Green respectfully request your presence down by the river. That would be on Sat, 8 am til noon. Help and learn. Not necessarily in that order. Shreveport Symphony musicians will be in the pit October 30 for The Shreveport Opera production of Mozart's Don Giovanni, writes musician and music blogger Susan Rogers. Christopher Allen and his bass have been making headlines here, she writes - Yarbrough Interiors has them making beautiful music on a local T.V. ad (I've seen it and it's kool.) And he has recently graced page 19 of Forum Magazine. If you like kool jazz, check it out. The I-49 Brass are giving a holiday concert at Broadmoor Presbyterian Church Sunday afternoon Dec 12. Members of the brass quintet are Rick Rowell, Mike Scarlato, Tom Hundemer, Mike Davidson and Mark Thompson. 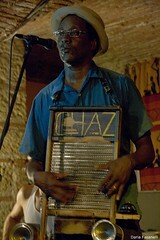 "Fantastic music from New Orleans, Washboard Chaz Blues Trio," says Jayne Lanza.. "More info at: www.washboardchaz.com. They will be performing both Friday and Saturday night, October 15 & 16. Missoni will be opening for them both evenings. It will be a little bit of that New Orleans flavor in Shreveport!" 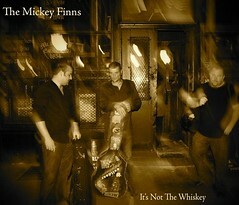 The Mickey Finns, a Celtic rock, world beat trio out of NYC, are visiting Louisiana this week. They have a date at the Centenary Band Shell on Tues, Oct 12, 7:30 pm. They're influenced by the Pogues, Tom Waits, The Prodigals, The Dubliners, Lhasa De Sela, Johnny Cash. They arrive highly-recommended by Doyle Jeter of Enoch's, in Monroe. 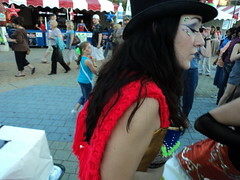 They will also perform at the NELa Celtic Festival. Irish music: it's always astounding when high-energy Celtic players grab you by the sonic neck, isn't it? Parading across and around Festival Plaza on Saturday, Escaped Images,the dance troupe from Centenary College, short-circuited the Revel crowd. The group wore incomprehensible costumes and spent hideous energy posing and tramping. By treating the entire site as their performance grounds, Escaped Images, under the direction of Renee Cheveallier, reminded the audience that top-hatted surprises are one of the treats of a good fest. In these days of the short budget, Revel 2010 seemed way less than surprising. Also making a tribal and wildly vibey appearance at the Revel was Dirtfoot, a band whisked in Shreveport but risen to a souffle on the festival circuit. This is a sextet of entertainers, not simply musicians. Matt Hazelton and J Bratlie were dancing on the beam while Scotty Gerardy was hanging from the beam. New bassist Nathan Woods wore out the pocket. Lane Bayliss punched and Daniel Breithaupt dodged. 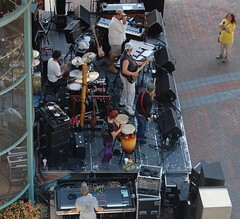 Everyone on stage seemed to oscillate through each number. Total animation along with easy-to-like new songs. Reminds us of the Marjorie Lyons Playhouse show a few months ago in which shirttails-out Dirtfoot was surrounded by the leggy Escaped Images. The show was a barroom brawl of artistic energy. Will Dirtfoot be granted a few breaks so it can kick through to the next plateau? Will the trustees at Centenary College restore the status of the dance program? Stand by for the usual: inch-by-inch, slow-breaking news. Whether they rise or displode, Escaped Images and Dirtfoot have laddered a high bar for performance art in this region. They're the real art deal. Study them, emulate their antics. Cheer them. Push them. 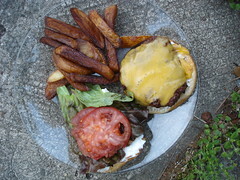 And you can toast Dirtfoot soon on a Facebook tv show called Grooveable Feast. Debuts Oct 20. Congrats, guys. The annual Friend-raiser for artspace is ArtScare, says Julia Foley. Monster Mash is the 2010 Artscare and includes all of the fun and excitement of previous ArtScare events. ArtScare is sponsored by Cumulus Radio, Mix 97.3 fm. Proceeds from ticket sales to ArtScare benefit the ongoing programing and exhibitions that support the arts and artists in Northwest Louisiana. $25 tickets get you dancing, food, and other participatory fun. 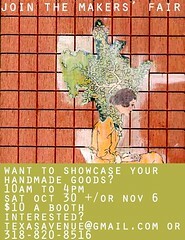 "Showcase your home-made goods for $10 a booth," says Allison Dickson West of the new Maker's Fair. She and April Dahm, of Texas Avenue Community Assoc, are producing the Maker's Fair on Sat, Oct 30 and Sat, Nov 6, 10 am to 4 pm. The location is the corner of Texas Avenue and Common Street in historic Downtown Shreveport. Those interested may call 318 820 8516 or bip texasavenue@gmail.com. 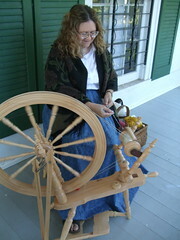 The LSU Shreveport Pioneer Heritage Center will host its annual Pioneer Day Saturday, October 9, 2010 from 10 a.m. to 4 p.m. at the Heritage Center located on the LSUS campus. Pioneer Day will give a better understanding to the public about the diverse lifestyle of settlers and the struggles of surviving in a natural environment. There will be 7 historic buildings that will portray lifestyles, homes, beliefs and customs that have impacted Louisiana. Admission for children under the age of five is free, and a $3.00 admission donation is requested for others. For more information call Marty Young at 318-797-5339. You may be like me in this: Red River Radio is where I get news, jazz, comedy and drama. It's a daily resource for me. To contribute to the fund drive - currently happening - is to keep urbanity alive in this region, I believe. Shreveport singer-songwriter Hanna Unverzagt will play live on Red River Radio. Buddy Flett will join us live on Red River Radio for some of his unique blues styling. Join us once again for AJ and the Two Tone Blues Band Live on Red River Radio. Join us for a performance by classical guitarist Giovanni DeChiaro on Red River Radio. Hanna Unverzagt photo by Barbara Beaird. On Saturday, October 9, NPR’s From the Top (11 am) broadcasts from the Young Artist World Piano Festival and features cellist John-Henry Crawford, age 17, says Red River Radio manager Kermit Poling. Crawford was raised in Shreveport. John-Henry comes from a musical family, performing on the 1821 cello passed down to him from his Austrian grandfather and cellist, Dr. Robert Popper. 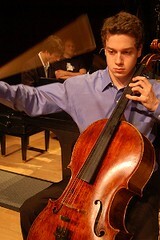 He has won numerous competitions, including a bronze medal in the Dallas Symphony’s Lynn Harrell Competition. Last fall, John-Henry was accepted into the prestigious Curtis Institute in Philadelphia. "We have produced the Louisiana Swamp Stomp CD to aid the funding of the The Northern Louisiana Brain and Spinal Cord Injury Foundation (NLBSCIF)," says Dr Paul McCarthy. The project was inspired by singer-guitarist Buddy Feltt and singer Carol Fran, two Louisiana musicians who have recently had neurological injuries. Available for $20, all proceeds benefit the Northern Louisiana Brain and Spinal Cord Injury Foundation. Also, in conjunction with the release of this CD, a Louisiana Swamp Stomp Party and Concert will be held at the Petroleum Club on in Shreveport, Louisiana on November 19 from 8pm - midnight. As a person who's heard an advance copy of the CD, I can attest that it is a rockin' collection, an appropriate soundtrack for driving and for all types of parties. "Fiesta del Dia de los Muertos, A celebration of life, art and family: come and join us to celebrate the traditional Mexican Holiday “Day of the Death”, on Saturday, October 23, 1-4 pm at Columbia Park (in front of Creswell School)," says Lee Spruell. "Bring your family to work on crafts, enjoy music, play games, listen to stories, eat traditional “Pan de Muertos”, break a big piñata and many other activities." Celebration sponsored by Voces Castellanas. year we're holding a student art and photography contest," says Heather Spaulding. "The theme is Louisiana's Natural Treasures, and students can enter their work anytime between now and the morning of the Celebration." She adds, "It will be a great opportunity for young artists to display their work at a community event, learn about local wildlife, and compete for a $25 first prize in each category. The artwork will be displayed from 9:00 a.m. to 3:00 p.m., and the prizes will be awarded at 1:00 p.m."
Bossier Arts Council has an outdoor art experience on Thursdays in October, says Kelly Warner. 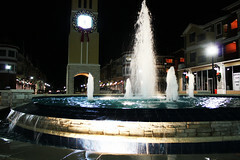 It is a 4 pm to 8 pm art walk in Villaggio, 5200 E Tex St, Bossier City. Performances on Weds, 9 to 11:30 pm. Prizes are, like, off the ching. Jayne Marie's has Los Angeles singer Angie Mattson on Sat, Oct 23, with "sultry Americana"
Performing at Jane Marie's on Cross Lake on Sat, Oct 23, is Angie Mattson, says Jayne Lanza. 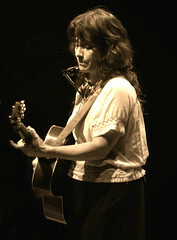 Mattson is an LA singer/songwriter who plays sultry, Americana-influenced folkrock, says her bio. She has worked as a model in Tokyo, hosted the NewNowNext awards show on the LOGO television network and toured with Suzanne Vega, Melissa Ferrick, and Uh Huh Her, playing shows across the US and Canada. Her new album, Skeleton Arm, is just out. 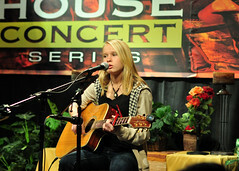 She was a hit at SXSW, says Hallie Pritts. The Centenary College Turner Art Center will feature an exhibit entitled The Artist Transit, Now and Then, says Deborah Allen. The show runs Oct 25 to Dec 12. 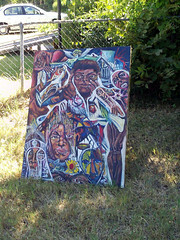 The opening reception will be October 31, 4 - 6 p.m.
Artists who exhibited at the Artist Transit, 1984 - 1987, include Craig Aple, Deborah Harold Allen, Cliff Brown, Mattie Brown, George Burton III, Gary Cathey, Randy Clearman, Carlos Colon, David Cooper, Joe DiSantos, Richard Edwards, Bart Gross, Dorothy Hanna, Clyde Hargrove, Dennis Harkom, Michael Harold, Gregg Hornbeak, Missy Hornbeak, Lewis Kalmbach, David Love Lewis, Christopher Martin, Michael Moore, Dennis O'Bryant, Denise Peske, Marc Rawls, Susan Schinn, Lisa Smith, and Patty Zahler. The reunion exhibit at Turner Art Center will showcase past and recent work of the above-mentioned artists. 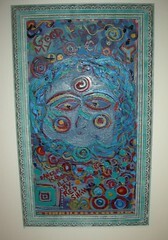 Artist Transit was located in Central Station Railroad Station, 1025 Marshall St. The roster included poets, painters, sculptors, installation artists, multi-media artists, performance artists and outsider artists. Oil Paintings by the late Frances Drew for sale by the artist's son, Gerald, at 151 Egan St.
"For as little as $50 a Frances Drew original oil painting can be yours," reports Kathryn Usher. "Her son, Gerald, says he will be selling them this weekend and through out next week." Frances Drew, an enormously productive painter known for her bold and color-rich scenes of regional life and images of suffering, died in 2007. Sale at 151 Egan St.
Fleur-de-lis and cypress trees! It's time for the Red River Revel crafts fair, Oct 2 - 9.